Critical engineering procedures and real world on-the-road testing are part of the continuous design process for all our products. 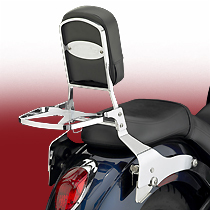 Paladin® Backrests and Luggage Racks are no exception. These are not "universal fit" generic products. 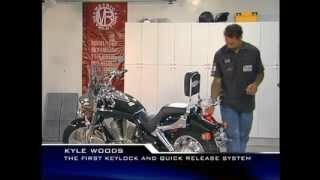 They are custom-designed for each model motorcycle. You can be sure they will not only look great, but fit and perform perfectly. 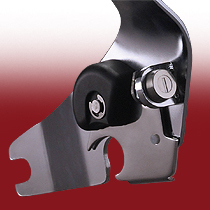 * Hardware Adapters Required to Mount Paladin® Mount Kits and Cruiseliner™ Mount Kits Together. 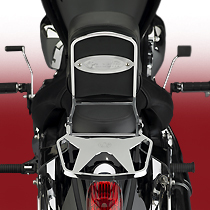 Paladin® QuickSet™ Mount Kit for Honda® VT750C/CD Shadow A.C.E. Convert your bike from a 2-up tourer to a solo boulevard cruiser in under 5 seconds, with no tools! The Paladin® QuickSet™ Back Rest uses an innovative, key-lockable mounting system that's designed for an optimal fit on each specific make and model. All moving components are made from stainless steel for years of reliable, smooth operation, and all visible metal components are either polished stainless steel or bright, show-quality chrome. After unlocking, just lift the levers on the bottom of the backrest side plates and pull up on the backrest to remove it. Now that's easy! The Paladin P9900 Luggage Rack, P9800A Back Rest (sideplates with lock, sissy bar and pad), and QuickSet Mount Kits are sold separately. NEW for Yamaha XV250 Virago and XV250 V Star! 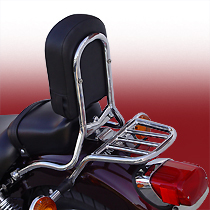 This backrest/Luggage Rack is made specially for the 2007-14 Yamaha XV250 Virago and XV250 V Star. This is not a QuickSet™ system – it mounts securely to the bike's frame, rear fender and turn signal brackets, and it perfectly matches the bike's style. NEW for Kawasaki EX300 Ninja! 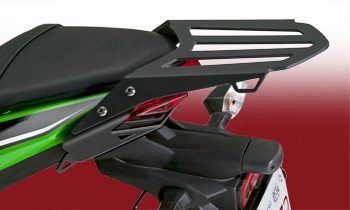 Our stylish and sturdy luggage rack was designed specially for the new EX300 Ninja to greatly improve the carrying capacity. Roomy rack surface with three bungee attachment points on each side allows riders to carry a decent sized duffel bag. The rack is made from precision, laser-cut aluminum, and the mounting bracket is made from precision cut and formed steel. Both integrate seamlessly with the lines and style of the EX300. Chromed Steel with Stainless Steel locking mechanism. QuickSet™ mounting hardware and keys are included in mount kits. 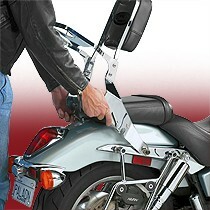 Paladin® QuickSet™ Mount Kits are application-specific to ensure the correct fit for your bike. Click the SHOP menu for fitment information for your motorcycle.